When you submit your FAFSA application each year, a federal formula is used to calculate your Expected Family Contribution (EFC) number. This number is an estimate of how much a student and their family can contribute toward educational expenses. This number is not an actual dollar amount that you are expected to pay. It is the number we must use to determine eligibility for need-based aid such as the Pell Grant and the Direct Subsidized Direct Loan. Once the EFC is calculated for the aid year, it may only be revised based on limited exceptional circumstances such as loss of employment or medical expenses. If your resources are not accurately reflected by this year’s EFC, you may contact our office regarding the Special Circumstance Appeal process. This is an estimate of the total cost of attendance TSU. This estimate includes tuition and fees, books and supplies as well as living costs such as housing, food, personal and miscellaneous expenses. Award amounts offered to reflect a two-term, full-time cost of attendance. These are estimated costs only and subject to change based on factors such as dining plan chosen, actual credits are taken, etc. The actual charges you can expect to see billed to the student account by TSU will only be tuition and fees and room and board (if applicable) on a per term basis. If a student is living off campus their student billing account will not be charged for housing and dining expenses. Financial need is determined by subtracting EFC from the cost of attendance. The remainder is considered "unmet need". If no financial need remains, the student eligibility will consist of non-need based aid such as an unsubsidized loan and/or Parent PLUS loan. Funds are awarded to eligible recipients on a first-come-first-serve basis. Certain programs, such as the Federal Supplemental Opportunity Grant, require the funding to go to students with the highest need. Need is determined by using the estimated costs for students by categories. 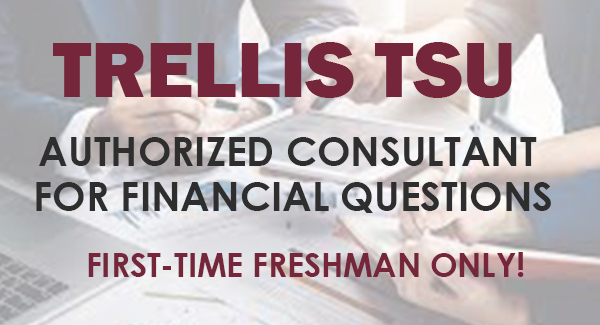 The component used when estimating the cost include; (1) tuition and fees, (2) books (3) room and board, (4) transportation, (5) personal and (6) loan fees (if applicable). The expected family contribution (EFC) is generated through the financial information supplied on the student's Free Application for Federal Student Aid. "Need" is determined by the following formula. Cost of Attendance - EFC = Need. Certain programs such as the Federal Direct PLUS loan program may exceed the need, but may not exceed the total cost of attendance as established by the institution. Generally, students with a zero EFC will receive priority in the awarding process. Students are considered for and awarded grant assistance and non-interest bearing loans prior to the awarding of the self-help aid. Consideration is given to students indicating their desire for work-study on the FAFSA during the awarding process. Federal Loans will be included in the award package but must be accepted by the student in order to initiate the loan process. Additional steps, such as the completion of Entrance Loan Counseling and the Master Promissory Note, are also required for the federal loan programs. 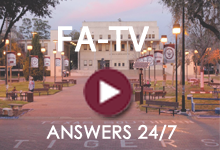 You may review your aid package through the use of your TSU MyWeb account. Though self-help aid such as federal loans is included in the award package, the student should carefully construct a financial plan that fits the student’s comfort level for accumulating debt. The student is free to accept, reduce or decline the aid based on personal preference or need. Additionally, students have 14 days after the disbursement of the federal loan to rescind and return the funds to the program. Funds that are recouped due to declination by students or attrition of previously awarded students are awarded based on need, the timing of the receipt of the application, and/or the number of eligible applicants at the time of award. The financial aid offer is based on the expectation of full-time enrollment and is divided up over the two-term academic year. Summer term is optional and awarded based on the previous Fall and Spring disbursements. If a student has exceeded the maximum allowed in combined aid, prior to Summer, they would not be eligible for additional aid until the next award period begin. However, they may apply for a plus or private loan. Your financial aid offer may include federal, state and institutional (insert scholarship link) aid. The federal loan offers are limited by both yearly and aggregate limits. The Parent and Graduate PLUS loans do not have yearly or aggregate maximums. The PLUS loans are shown on the award letters, but require a separate application and credit check that can be completed each year at studentloans.gov. You can accept, decline, or adjust most parts of your financial aid award. The Pell Grant does not require your acceptance. A student cannot make an upward adjustment, only reduce an existing award.